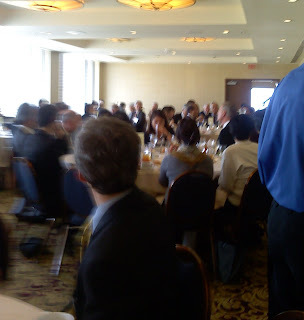 As a member of the Japan Society of Northern California and as a representative of hashi.org, I was honored to attend a luncheon at the Nikko Hotel in San Francisco featuring a talk by the newly-appointed US Ambassador to Japan, John V. Roos. The luncheon was well-attended by around 200 people. As I looked around the room, it occured to me, these people represent the core of America's contribution to this most-important alliance of two nations. I was truly humbled and honored to be there. I met international business owners, administrators from the Japan Society, a woman that arranges home-stay opportunities in San Francisco, the Consul General, and finally, the Ambassador himself. In our brief talk, I introduced myself and hashi.org and gave him a brochure to learn more about us. He was gracious and seemed genuinely interested in what we're doing. And it was refreshing to hear his first-hand impressions of what's going on in East Asia, as opposed to the (sometimes biased) sound bytes we get on our news. Many thanks to Dana, at the Japan Society, for arranging this important, informative, and enjoyable event. CLICK HERE for more info.